KM#201 1 cent. Year: 1977. Weight: 3.12 g [3.11 g]. Metal: Bronze (95% Cu and 5% Zn or Tin). Diameter: 19.00 mm. Edge: Plain. Alignment: Coin. Mint: Philadelphia, USA. Obverse: "IN GOD WE TRUST" motto at the top. Right facing profile of President Abraham Lincoln. "LIBERTY" written at the left side horizontally. Date at the chest of Abraham Lincoln. "V.D.B" written at 7 o'clock near the edge. Reverse: "UNITED STATES OF AMERICA" written at the top section. "E·PLURIBUS·UNUM" (Latin for "Out of many, one") written above Lincoln Memorial building. Lincoln Memorial building in the center. "ONE CENT" written at the bottom. Mintage: 4,469,930,000. Mintage Years: [see under 1959]. Engraver: Victor David Brenner (Lincoln portrait side) and Frank Gasparro (Value side). KM#201 1 cent. Year: 1977D. Weight: 3.08 g [3.11 g]. Metal: Bronze (95% Cu and 5% Zn or Tin). Diameter: 19.00 mm. Edge: Plain. Alignment: Coin. Mint: Denver, USA. Obverse: "IN GOD WE TRUST" motto at the top. Right facing profile of President Abraham Lincoln. "LIBERTY" written at the left side horizontally. Date at the chest of Abraham Lincoln. "V.D.B" written at 7 o'clock near the edge. "D" written below Date. Reverse: "UNITED STATES OF AMERICA" written at the top section. "E·PLURIBUS·UNUM" (Latin for "Out of many, one") written above Lincoln Memorial building. Lincoln Memorial building in the center. 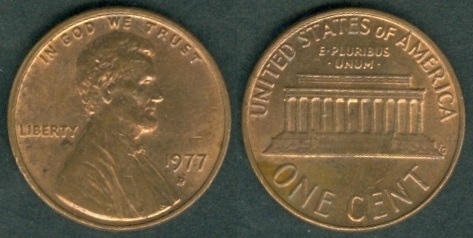 "ONE CENT" written at the bottom. Mintage: 4,194,062,300. Mintage Years: [see under 1959]. Engraver: Victor David Brenner (Lincoln portrait side) and Frank Gasparro (Value side). KM#A132 1 cent. Year: 1977S. Weight: 3.16 g [3.11 g]. Metal: Bronze. Diameter: 19.00 mm. Edge: Plain. Alignment: Coin. Mint: San Francisco, USA. Obverse: "IN GOD WE TRUST" motto at the top. Right facing profile of President Abraham Lincoln. "LIBERTY" written at the left side horizontally. Date at the chest of Abraham Lincoln. "V.D.B" written at 7 o'clock near the edge. "S" written below Date. Reverse: "UNITED STATES OF AMERICA" written at the top section. "E·PLURIBUS·UNUM" (Latin for "Out of many, one") written above Lincoln Memorial building. Lincoln Memorial building in the center. "ONE CENT" written at the bottom. Mintage: 3,251,152 Proof. Mintage Years: [see under 1959]. Engraver: Victor David Brenner (Lincoln portrait side) and Frank Gasparro (Value side). KM#A192 5 cents (Nickel). Year: 1977. Weight: 4.97 g [5.00 g]. Metal: Copper-Nickel. Diameter: 21.20 mm. Edge: Plain. Alignment: Coin. Mint: Philadelphia, USA. 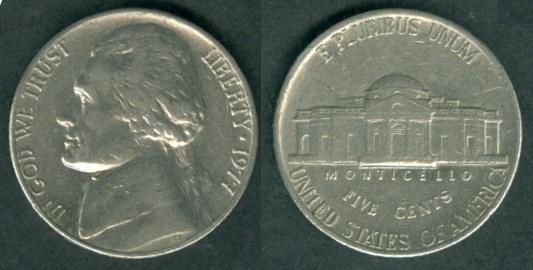 Obverse: The portrait of Thomas Jefferson (The 3rd President of the United States from 1801 to 1809) facing left in the center. Motto: "IN GOD WE TRUST" "LIBERTY" written at the right side clockwise. "LIBERTY" with Date having star (*) in between written at the right side clockwise. Designer’s initial “F” is below the Date. Reverse: "E PLURIBUS UNUM" (Latin for "Out of many, one") written at the top. A representation of Monticello, President Thomas Jefferson's Virginia home in the center. "MONTICELLO" and " FIVE CENTS" written below the building. "UNITED STATES OF AMERICA" written at the bottom section. Mintage: 585,376,000. Mintage Years: [see under 1946]. Engraver: Felix Oscar Schlag (both sides). KM#A192 5 cents (Nickel). Year: 1977S. Weight: 5.09 g [5.00 g]. Metal: Copper-Nickel. Diameter: 21.20 mm. Edge: Plain. Alignment: Coin. Mint: San Francisco, USA. 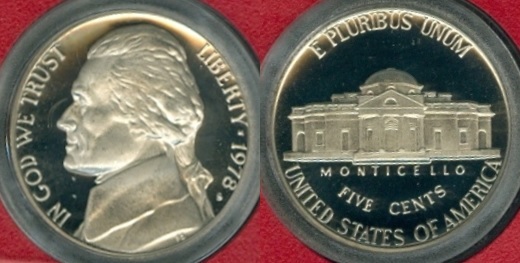 Obverse: The portrait of Thomas Jefferson (The 3rd President of the United States from 1801 to 1809) facing left in the center. Motto: "IN GOD WE TRUST" "LIBERTY" written at the right side clockwise. "LIBERTY" with Date having star (*) in between written at the right side clockwise. Designer’s initial “F” is below the Date. "S" mint mark seen below the Date. Reverse: "E PLURIBUS UNUM" (Latin for "Out of many, one") written at the top. A representation of Monticello, President Thomas Jefferson's Virginia home in the center. "MONTICELLO" and " FIVE CENTS" written below the building. "UNITED STATES OF AMERICA" written at the bottom section. 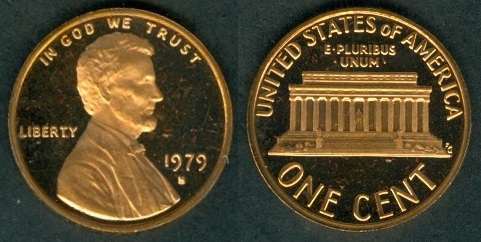 Mintage: 3,251,152 Proof. Mintage Years: [see under 1946]. Engraver: Felix Oscar Schlag (both sides). KM#195a Dime (10 cents). Year: 1977S. Weight: 2.27 g [2.27 g]. Metal: Copper-nickel clad Copper. Diameter: 17.90 mm. Edge: Reeded. Alignment: Coin. Mint: San Francisco, USA. 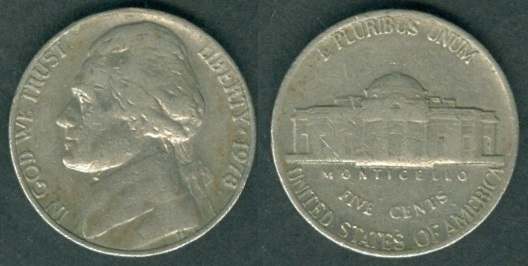 Obverse: "LIBERTY" is written at the top left clockwise. The portrait of Franklin D. Roosevel (32nd President of the United States from 1933 to his death in 1945) facing left in the center. Motto: "IN GOD WE TRUST" is at bottom left side. Date at the bottom right side. Reverse: "UNITED STATES OF AMERICA" written at the top section. An olive branch, a torch and an oak branch in the center, symbolize respectively peace, liberty and victory. Motto "E • PLU RIB US • U NUM" (Latin for "Out of many, one") written between the stems and base of the torch. Value "• ONE DIME •" written at the bottom section. Mintage: 3,251,152 Proof. Mintage Years: [see under 1965]. Engraver: John Ray Sinnock (both sides). This coin is commonly known by coin collectors as "Roosevelt Copper-Nickel Dime". 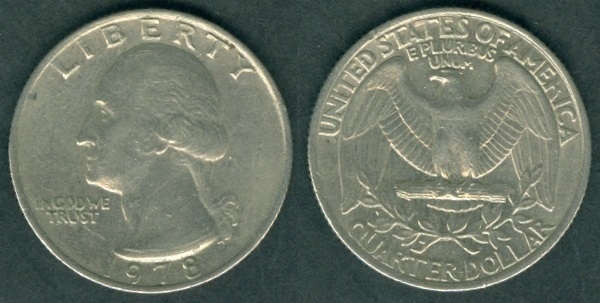 Mintmark "D" or "S" is above Date. KM#A164a Quarter Dollar (25 cents). Year: 1977S. Weight: 5.62 g [5.67 g]. Metal: Copper-nickel clad Copper. Diameter: 24.30 mm. Edge: Reeded. Alignment: Coin. Mint: San Francisco, USA. Obverse: "LIBERTY" written at the top. George Washington's head facing left in the center. Motto: "IN GOD WE TRUST" written in two lines at bottom left side. Date at the bottom. "S" mintmark besides the hair ribbon knot. Reverse: "UNITED STATES OF AMERICA" written at the top. An eagle, looking left, wings spread, and standing on a shaft of arrows with two olive sprays beneath it in the center. "E PLURIBUS UNUM" (Latin for "Out of many, one") written above the Eagle's head in two lines. 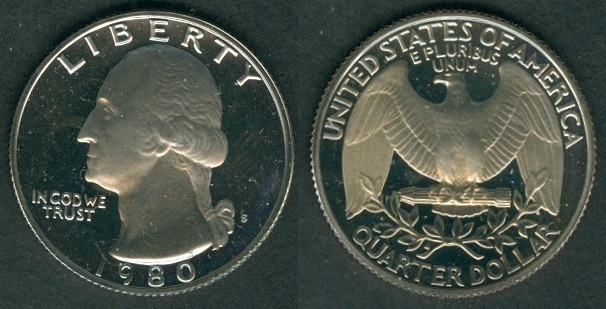 "QUARTER DOLLAR" written at the bottom. Mintage: 3,251,152 Proof. 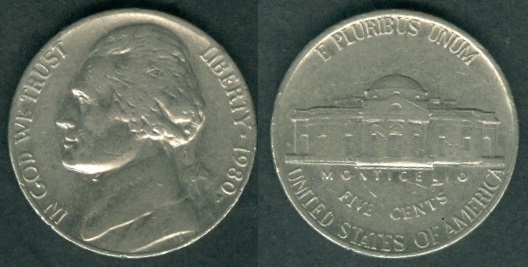 Mintage Years: 1977, 1977D, 1977S, 1978, 1978D, 1978S, 1979, 1979D, 1979S type I (Filled S), 1979S type II (clear S), 1980P, 1980D, 1980S, 1981P, 1981D, 1981S type I (Filled S), 1981S type II (clear S), 1982P, 1982D, 1982S, 1983P, 1983D, 1983S, 1984P, 1984D, 1984S, 1985P, 1985D, 1985S, 1986P, 1986D, 1986S, 1987P, 1987D, 1987S, 1988P, 1988D, 1988S, 1989P, 1989D, 1989S, 1990P, 1990D, 1990S, 1991P, 1991D, 1991S, 1992P, 1992D, 1992S, 1993P, 1993D, 1993S, 1994P, 1994D, 1994S, 1995P, 1995D, 1995S, 1996P, 1996D, 1996S, 1997P, 1997D, 1997S, 1998P, 1998D and 1998S. Engraver: John Flanagan (both sides). This coin is commonly known by coin collectors as "Washington Quarter". Note: KM#A164a is resumed with same design and composition as KM#164a. KM# A164b were produce in Silver [6.25 g] by San Francisco Mint from 1992 to 1998 with "S" mintmark. KM#A202b Half Dollar (50 cents). Year: 1977S. Weight: 11.22 g [11.34 g]. Metal: Copper-Nickel Clad Copper. Diameter: 30.61 mm. Edge: Reeded. Alignment: Coin. Mint: San Francisco, USA. Obverse: "LIBERTY" written at the section. President John Fitzgerald Kennedy facing right in the center. Motto: "IN GOD WE TRUST" written besides his neck. Date at the bottom. Reverse: "UNITED STATES OF AMERICA" written at the top section. State emblem (eagle with shield with "E PLURIBUS UNUM" on the banner) with ring of 50 stars in the center. One Dot on each side. 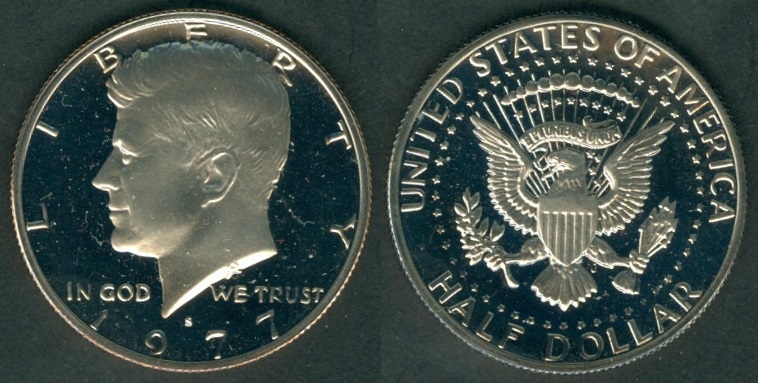 Value "HALF DOLLAR" written at the bottom. Mintage: 3,251,152 Proof. 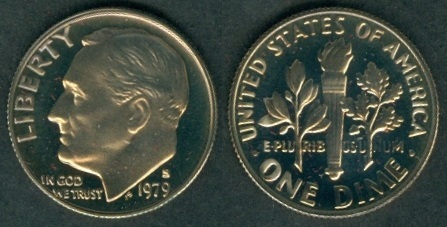 Mintage Years: 1977, 1977D, 1977S, 1978, 1978D, 1978S, 1979, 1979D, 1979S type I (Filled S), 1979S type II (Clear S), 1980P, 1980D, 1980S, 1981P, 1981D, 1981S type I (Filled S), 1981S type II (Clear S), 1982P, 1982P no initials "FG", 1982D, 1982S, 1983P, 1983D, 1983S, 1984P, 1984D, 1984S, 1985P, 1985D, 1985S, 1986P, 1986D, 1986S, 1987P, 1987D, 1987S, 1988P, 1988D, 1988S, 1989P, 1989D, 1989S, 1990P, 1990D, 1990S, 1991P, 1991D, 1991S, 1992P, 1992D, 1992S, 1993P, 1993D, 1993S, 1994P, 1994D, 1994S, 1995P, 1995D, 1995S, 1996P, 1996D, 1996S, 1997P, 1997D, 1997S, 1998P, 1998D, 1998S, 1999P, 1999D, 1999S, 2000P, 2000D, 2000S, 2001P, 2001D, 2001S, 2002P, 2002D, 2002S, 2003P, 2003D, 2003S, 2004P, 2004D, 2004S, 2005P, 2005P Satin Finish. 2005D, 2005D Satin Finish, 2005S, 2006P, 2006P Satin Finish, 2006D, 2006D Satin Finish, 2006S, 2007P, 2007P Satin Finish, 2007D, 2007D Satin Finish, 2007S, 2008P, 2008D, 2008S, 2009P, 2009D, 2009S, 2010P, 2010D, 2010S, 2011P, 2011D, 2011S, 2012P, 2012D, 2012S, 2013P, 2013D, 2013S, 2014P, 2014D, 2014S, 2015P, 2015D, 2015S, 2016P, 2016D, 2016S, 2017P, 2017D, 2017S, 2017S Enhanced Uncirculated, 2018P, 2018D, 2018S. Engraver: Gilroy Roberts (Kennedy portrait side) and Frank Gasparro (Value side). KM#A203 Dollar. Year: 1977S. Weight: 22.46 g [22.68 g]. Metal: Copper-Nickel Clad Copper. Diameter: 38.10 mm. Edge: Reeded. Alignment: Coin. Mint: San Francisco, USA. Obverse: "LIBERTY" written at the section. President Dwight D. Eisenhower portrait facing left in the center. Motto: "IN GOD WE TRUST" written besides his neck. Date at the bottom. Reverse: "UNITED STATES OF AMERICA" written at the top section. "E PLURIBUS UNUM" written above the Eagle. Eagle flying above the moon with olive branch while planet Earth is in the background [The Apollo 11 Mission Insignia]. 13 stars around the Eagle in circular form. "ONE DOLLAR" written at the bottom. Mintage: 3,251,152 Proof. 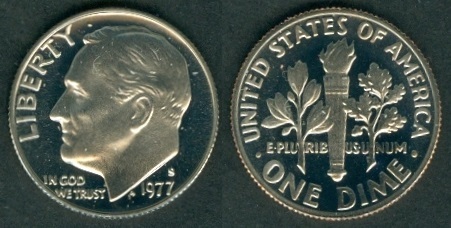 Mintage Years: 1977, 1977D, 1977S, 1978, 1978D and 1978S. Engraver: Frank Gasparro (both sides). 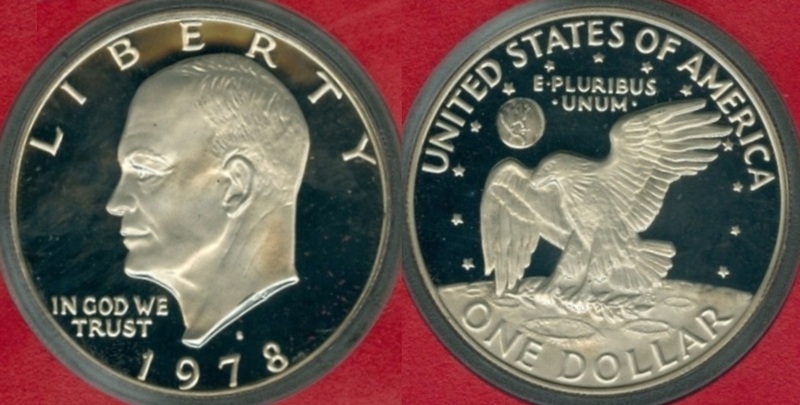 This coin is known as "Eisenhower Dollar" among coin collectors. KM#201 1 cent. Year: 1978. Weight: 3.07 g [3.11 g]. Metal: Bronze (95% Cu and 5% Zn or Tin). Diameter: 19.00 mm. Edge: Plain. Alignment: Coin. Mint: Philadelphia, USA. Obverse: "IN GOD WE TRUST" motto at the top. Right facing profile of President Abraham Lincoln. "LIBERTY" written at the left side horizontally. Date at the chest of Abraham Lincoln. "V.D.B" written at 7 o'clock near the edge. Reverse: "UNITED STATES OF AMERICA" written at the top section. "E·PLURIBUS·UNUM" (Latin for "Out of many, one") written above Lincoln Memorial building. Lincoln Memorial building in the center. "ONE CENT" written at the bottom. Mintage: 5,558,605,000. Mintage Years: [see under 1959]. Engraver: Victor David Brenner (Lincoln portrait side) and Frank Gasparro (Value side). KM#201 1 cent. Year: 1978D. Weight: 3.13 g [3.11 g]. Metal: Bronze (95% Cu and 5% Zn or Tin). Diameter: 19.00 mm. Edge: Plain. Alignment: Coin. Mint: Denver, USA. Obverse: "IN GOD WE TRUST" motto at the top. Right facing profile of President Abraham Lincoln. "LIBERTY" written at the left side horizontally. Date at the chest of Abraham Lincoln. "V.D.B" written at 7 o'clock near the edge. "D" written below Date. Reverse: "UNITED STATES OF AMERICA" written at the top section. "E·PLURIBUS·UNUM" (Latin for "Out of many, one") written above Lincoln Memorial building. Lincoln Memorial building in the center. 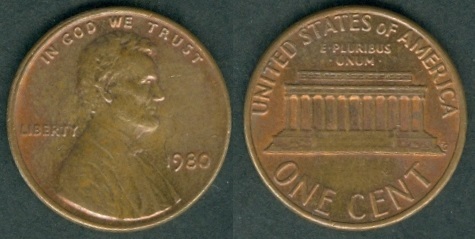 "ONE CENT" written at the bottom. Mintage: 4,280,233,400. Mintage Years: [see under 1959]. Engraver: Victor David Brenner (Lincoln portrait side) and Frank Gasparro (Value side). KM#A132 1 cent. Year: 1978S. Weight: 3.11 g [3.11 g]. Metal: Bronze. Diameter: 19.00 mm. Edge: Plain. Alignment: Coin. Mint: San Francisco, USA. Obverse: "IN GOD WE TRUST" motto at the top. Right facing profile of President Abraham Lincoln. "LIBERTY" written at the left side horizontally. Date at the chest of Abraham Lincoln. "V.D.B" written at 7 o'clock near the edge. "S" written below Date. Reverse: "UNITED STATES OF AMERICA" written at the top section. "E·PLURIBUS·UNUM" (Latin for "Out of many, one") written above Lincoln Memorial building. Lincoln Memorial building in the center. "ONE CENT" written at the bottom. Mintage: 3,127,781 Proof. Mintage Years: [see under 1959]. Engraver: Victor David Brenner (Lincoln portrait side) and Frank Gasparro (Value side). KM#A192 5 cents (Nickel). Year: 1978. Weight: 5.02 g [5.00 g]. Metal: Copper-Nickel. Diameter: 21.20 mm. Edge: Plain. Alignment: Coin. Mint: Philadelphia, USA. Obverse: The portrait of Thomas Jefferson (The 3rd President of the United States from 1801 to 1809) facing left in the center. Motto: "IN GOD WE TRUST" "LIBERTY" written at the right side clockwise. "LIBERTY" with Date having star (*) in between written at the right side clockwise. Designer’s initial “F” is below the Date. Reverse: "E PLURIBUS UNUM" (Latin for "Out of many, one") written at the top. A representation of Monticello, President Thomas Jefferson's Virginia home in the center. "MONTICELLO" and " FIVE CENTS" written below the building. "UNITED STATES OF AMERICA" written at the bottom section. Mintage: 391,308,000. Mintage Years: [see under 1946]. Engraver: Felix Oscar Schlag (both sides). KM#A192 5 cents (Nickel). Year: 1978S. Weight: 5.00 g [5.00 g]. Metal: Copper-Nickel. Diameter: 21.20 mm. Edge: Plain. Alignment: Coin. Mint: San Francisco, USA. Obverse: The portrait of Thomas Jefferson (The 3rd President of the United States from 1801 to 1809) facing left in the center. Motto: "IN GOD WE TRUST" "LIBERTY" written at the right side clockwise. "LIBERTY" with Date having star (*) in between written at the right side clockwise. Designer’s initial “F” is below the Date. "S" mint mark seen below the Date. Reverse: "E PLURIBUS UNUM" (Latin for "Out of many, one") written at the top. A representation of Monticello, President Thomas Jefferson's Virginia home in the center. "MONTICELLO" and " FIVE CENTS" written below the building. "UNITED STATES OF AMERICA" written at the bottom section. Mintage: 3,127,781 Proof. Mintage Years: [see under 1946]. Engraver: Felix Oscar Schlag (both sides). KM#195a Dime (10 cents). Year: 1978S. Weight: 2.27 g [2.27 g]. Metal: Copper-nickel clad Copper. Diameter: 17.90 mm. Edge: Reeded. Alignment: Coin. Mint: San Francisco, USA. Obverse: "LIBERTY" is written at the top left clockwise. The portrait of Franklin D. Roosevel (32nd President of the United States from 1933 to his death in 1945) facing left in the center. Motto: "IN GOD WE TRUST" is at bottom left side. Date at the bottom right side. Reverse: "UNITED STATES OF AMERICA" written at the top section. An olive branch, a torch and an oak branch in the center, symbolize respectively peace, liberty and victory. Motto "E • PLU RIB US • U NUM" (Latin for "Out of many, one") written between the stems and base of the torch. Value "• ONE DIME •" written at the bottom section. Mintage: 3,127,781 Proof. Mintage Years: [see under 1965]. Engraver: John Ray Sinnock (both sides). This coin is commonly known by coin collectors as "Roosevelt Copper-Nickel Dime". Mintmark "D" or "S" is above Date. KM#A164a Quarter Dollar (25 cents). Year: 1978. Weight: 5.54 g [5.67 g]. Metal: Copper-nickel clad Copper. Diameter: 24.30 mm. Edge: Reeded. Alignment: Coin. Mint: Philadelphia, USA. Obverse: "LIBERTY" written at the top. George Washington's head facing left in the center. Motto: "IN GOD WE TRUST" written in two lines at bottom left side. Date at the bottom. Reverse: "UNITED STATES OF AMERICA" written at the top. An eagle, looking left, wings spread, and standing on a shaft of arrows with two olive sprays beneath it in the center. "E PLURIBUS UNUM" (Latin for "Out of many, one") written above the Eagle's head in two lines. 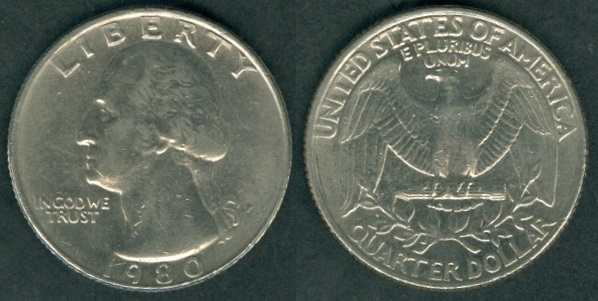 "QUARTER DOLLAR" written at the bottom. Mintage: 521,452,000. Mintage Years: [see above under 1977]. Engraver: John Flanagan (both sides). This coin is commonly known by coin collectors as "Washington Quarter". KM#A164a Quarter Dollar (25 cents). Year: 1978S. Weight: 5.59 g [5.67 g]. Metal: Copper-nickel clad Copper. Diameter: 24.30 mm. Edge: Reeded. Alignment: Coin. Mint: San Francisco, USA. Obverse: "LIBERTY" written at the top. George Washington's head facing left in the center. Motto: "IN GOD WE TRUST" written in two lines at bottom left side. Date at the bottom. "S" mintmark besides the hair ribbon knot. Reverse: "UNITED STATES OF AMERICA" written at the top. An eagle, looking left, wings spread, and standing on a shaft of arrows with two olive sprays beneath it in the center. "E PLURIBUS UNUM" (Latin for "Out of many, one") written above the Eagle's head in two lines. "QUARTER DOLLAR" written at the bottom. Mintage: 3,127,781 Proof. Mintage Years: [see above under 1977]. Engraver: John Flanagan (both sides). This coin is commonly known by coin collectors as "Washington Quarter". KM#A202b Half Dollar (50 cents). Year: 1978S. Weight: 11.24 g [11.34 g]. Metal: Copper-Nickel Clad Copper. Diameter: 30.61 mm. Edge: Reeded. Alignment: Coin. Mint: San Francisco, USA. Obverse: "LIBERTY" written at the section. President John Fitzgerald Kennedy facing right in the center. Motto: "IN GOD WE TRUST" written besides his neck. Date at the bottom. Reverse: "UNITED STATES OF AMERICA" written at the top section. State emblem (eagle with shield with "E PLURIBUS UNUM" on the banner) with ring of 50 stars in the center. One Dot on each side. 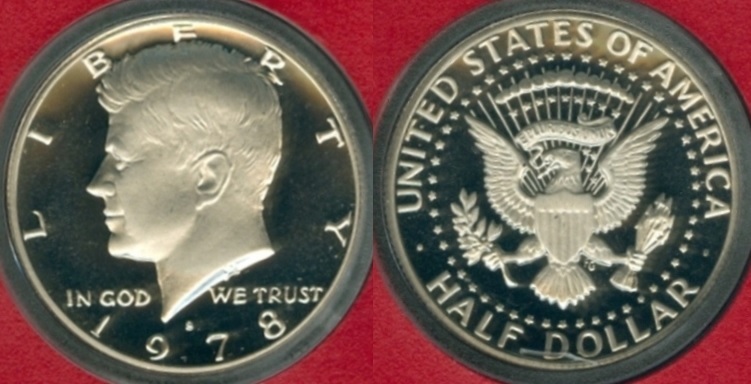 Value "HALF DOLLAR" written at the bottom. Mintage: 3,127,781 Proof. Mintage Years: [see above under 1977]. Engraver: Gilroy Roberts (Kennedy portrait side) and Frank Gasparro (Value side). KM#A203 Dollar. Year: 1978S. Weight: 22.42 g [22.68 g]. Metal: Copper-Nickel Clad Copper. Diameter: 38.10 mm. Edge: Reeded. Alignment: Coin. Mint: San Francisco, USA. Obverse: "LIBERTY" written at the section. President Dwight D. Eisenhower portrait facing left in the center. Motto: "IN GOD WE TRUST" written besides his neck. Date at the bottom. Reverse: "UNITED STATES OF AMERICA" written at the top section. "E PLURIBUS UNUM" written above the Eagle. Eagle flying above the moon with olive branch while planet Earth is in the background [The Apollo 11 Mission Insignia]. 13 stars around the Eagle in circular form. "ONE DOLLAR" written at the bottom. Mintage: 3,251,152 Proof. 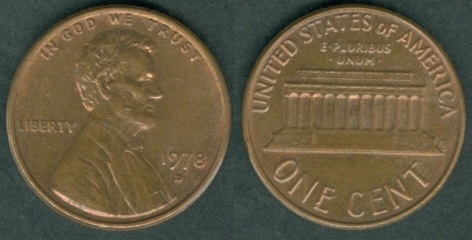 Mintage Years: 1977, 1977D, 1977S, 1978, 1978D and 1978S. Engraver: Frank Gasparro (both sides). 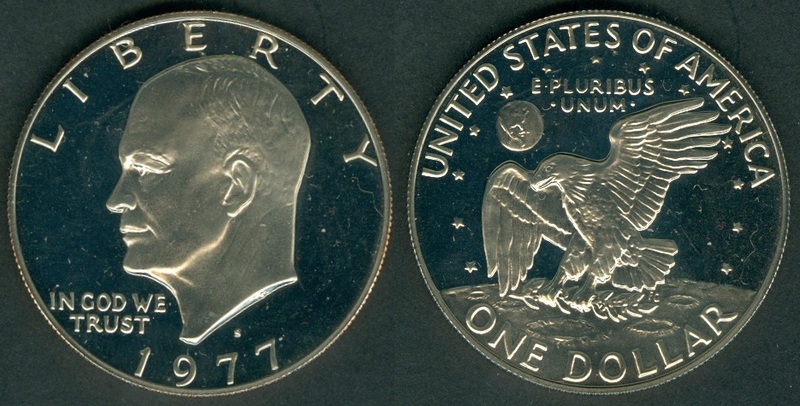 This coin is known as "Eisenhower Dollar" among coin collectors. KM#201 1 cent. Year: 1979. Weight: 3.07 g [3.11 g]. Metal: Bronze (95% Cu and 5% Zn or Tin). Diameter: 19.00 mm. Edge: Plain. Alignment: Coin. Mint: Philadelphia, USA. Obverse: "IN GOD WE TRUST" motto at the top. Right facing profile of President Abraham Lincoln. "LIBERTY" written at the left side horizontally. Date at the chest of Abraham Lincoln. "V.D.B" written at 7 o'clock near the edge. Reverse: "UNITED STATES OF AMERICA" written at the top section. "E·PLURIBUS·UNUM" (Latin for "Out of many, one") written above Lincoln Memorial building. Lincoln Memorial building in the center. "ONE CENT" written at the bottom. Mintage: 6,018,515,000. Mintage Years: [see under 1959]. Engraver: Victor David Brenner (Lincoln portrait side) and Frank Gasparro (Value side). KM#201 1 cent. Year: 1979D. Weight: 3.18 g [3.11 g]. Metal: Bronze (95% Cu and 5% Zn or Tin). Diameter: 19.00 mm. Edge: Plain. Alignment: Coin. Mint: Denver, USA. Obverse: "IN GOD WE TRUST" motto at the top. Right facing profile of President Abraham Lincoln. "LIBERTY" written at the left side horizontally. Date at the chest of Abraham Lincoln. "V.D.B" written at 7 o'clock near the edge. "D" written below Date. Reverse: "UNITED STATES OF AMERICA" written at the top section. "E·PLURIBUS·UNUM" (Latin for "Out of many, one") written above Lincoln Memorial building. Lincoln Memorial building in the center. "ONE CENT" written at the bottom. Mintage: 4,139,357,254. Mintage Years: [see under 1959]. Engraver: Victor David Brenner (Lincoln portrait side) and Frank Gasparro (Value side). KM#A132 1 cent. Year: 1979S. Weight: 3.14 g [3.11 g]. Metal: Bronze. Diameter: 19.00 mm. Edge: Plain. Alignment: Coin. Mint: San Francisco, USA. Obverse: "IN GOD WE TRUST" motto at the top. Right facing profile of President Abraham Lincoln. "LIBERTY" written at the left side horizontally. Date at the chest of Abraham Lincoln. "V.D.B" written at 7 o'clock near the edge. "S" written below Date. Filled "S" Type. Reverse: "UNITED STATES OF AMERICA" written at the top section. "E·PLURIBUS·UNUM" (Latin for "Out of many, one") written above Lincoln Memorial building. Lincoln Memorial building in the center. 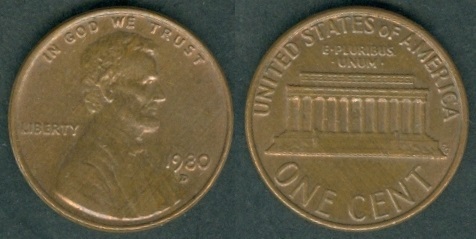 "ONE CENT" written at the bottom. 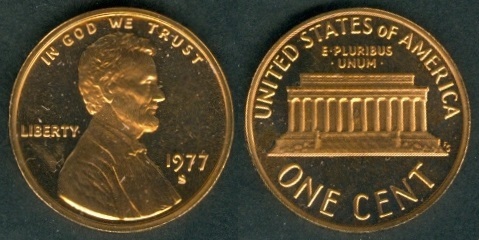 Mintage: 3,677,175 Proof (both types). Mintage Years: [see under 1959]. Engraver: Victor David Brenner (Lincoln portrait side) and Frank Gasparro (Value side). Filled "S" Types were produced from January to November while the Clear "S" Type were produced in November to December in 1979. KM#A192 5 cents (Nickel). Year: 1979S. Weight: 4.96 g [5.00 g]. Metal: Copper-Nickel. Diameter: 21.20 mm. Edge: Plain. Alignment: Coin. Mint: San Francisco, USA. Obverse: The portrait of Thomas Jefferson (The 3rd President of the United States from 1801 to 1809) facing left in the center. Motto: "IN GOD WE TRUST" "LIBERTY" written at the right side clockwise. "LIBERTY" with Date having star (*) in between written at the right side clockwise. Designer’s initial “F” is below the Date. "S" mint mark seen below the Date. Filled "S" Type. Reverse: "E PLURIBUS UNUM" (Latin for "Out of many, one") written at the top. A representation of Monticello, President Thomas Jefferson's Virginia home in the center. "MONTICELLO" and " FIVE CENTS" written below the building. "UNITED STATES OF AMERICA" written at the bottom section. 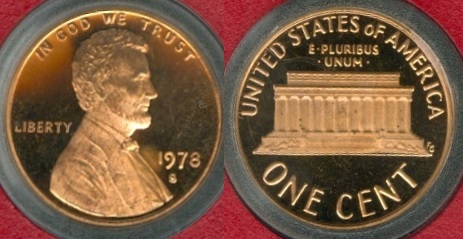 Mintage: 3,677,175 Proof (both types: Filled "S" and Clear "S"). Mintage Years: [see under 1946]. Engraver: Felix Oscar Schlag (both sides). KM#195a Dime (10 cents). Year: 1979S. Weight: 2.27 g [2.27 g]. Metal: Copper-nickel clad Copper. Diameter: 17.90 mm. Edge: Reeded. Alignment: Coin. Mint: San Francisco, USA. 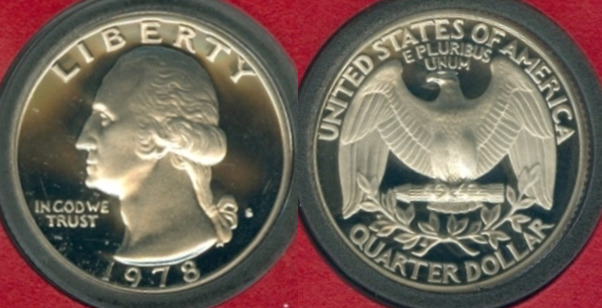 Obverse: "LIBERTY" is written at the top left clockwise. The portrait of Franklin D. Roosevel (32nd President of the United States from 1933 to his death in 1945) facing left in the center. Motto: "IN GOD WE TRUST" is at bottom left side. Date at the bottom right side. "S" mint mark seen below the Date. Filled "S" Type. Reverse: "UNITED STATES OF AMERICA" written at the top section. An olive branch, a torch and an oak branch in the center, symbolize respectively peace, liberty and victory. Motto "E • PLU RIB US • U NUM" (Latin for "Out of many, one") written between the stems and base of the torch. Value "• ONE DIME •" written at the bottom section. 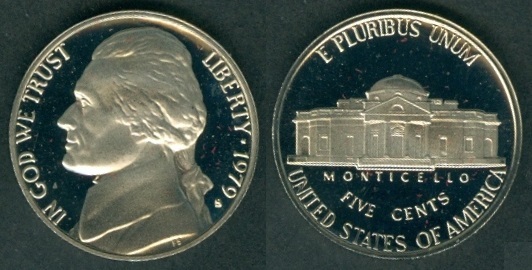 Mintage: 3,677,175 Proof (both types: Filled "S" and Clear "S"). Mintage Years: [see under 1965]. Engraver: John Ray Sinnock (both sides). This coin is commonly known by coin collectors as "Roosevelt Copper-Nickel Dime". Mintmark "D" or "S" is above Date. KM#A164a Quarter Dollar (25 cents). Year: 1979S. Weight: 5.59 g [5.67 g]. Metal: Copper-nickel clad Copper. Diameter: 24.30 mm. Edge: Reeded. Alignment: Coin. Mint: San Francisco, USA. Obverse: "LIBERTY" written at the top. George Washington's head facing left in the center. Motto: "IN GOD WE TRUST" written in two lines at bottom left side. Date at the bottom. "S" mintmark besides the hair ribbon knot. Filled "S" Type. Reverse: "UNITED STATES OF AMERICA" written at the top. An eagle, looking left, wings spread, and standing on a shaft of arrows with two olive sprays beneath it in the center. "E PLURIBUS UNUM" (Latin for "Out of many, one") written above the Eagle's head in two lines. "QUARTER DOLLAR" written at the bottom. 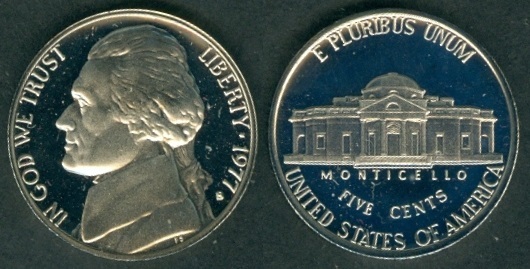 Mintage: 3,677,175 Proof (both types: Filled "S" and Clear "S"). Mintage Years: [see above under 1977]. Engraver: John Flanagan (both sides). This coin is commonly known by coin collectors as "Washington Quarter". KM#A202b Half Dollar (50 cents). Year: 1979S. Weight: 11.11 g [11.34 g]. Metal: Copper-Nickel Clad Copper. Diameter: 30.61 mm. Edge: Reeded. Alignment: Coin. Mint: San Francisco, USA. Obverse: "LIBERTY" written at the section. President John Fitzgerald Kennedy facing right in the center. Motto: "IN GOD WE TRUST" written besides his neck. Date at the bottom. Reverse: "UNITED STATES OF AMERICA" written at the top section. State emblem (eagle with shield with "E PLURIBUS UNUM" on the banner) with ring of 50 stars in the center. One Dot on each side. 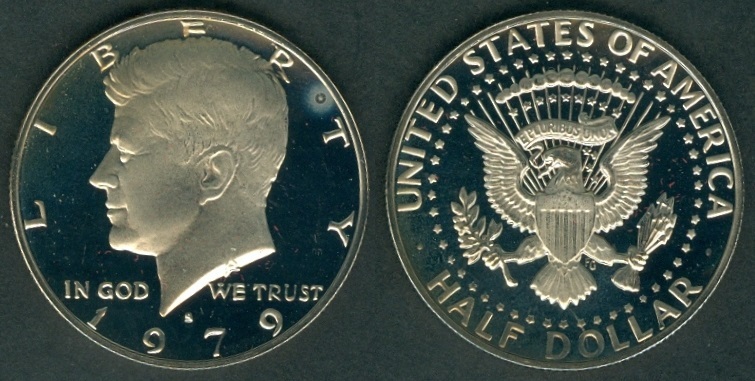 Value "HALF DOLLAR" written at the bottom. 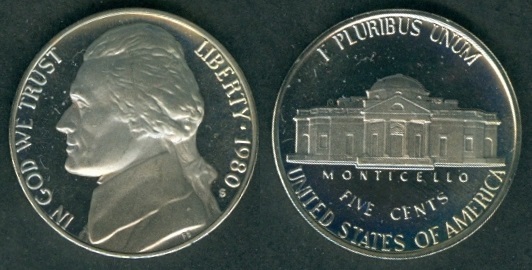 Mintage: 3,677,175 Proof (both types: Filled "S" and Clear "S"). Mintage Years: [see above under 1977]. Engraver: Gilroy Roberts (Kennedy portrait side) and Frank Gasparro (Value side). Filled "S" Type. KM#207 Dollar. Year: 1979P. Weight: 8.00 g [8.10 g]. Metal: Copper-Nickel Clad Copper. Diameter: 26.50 mm. Edge: Reeded. Alignment: Coin. Mint: Philadelphia, USA. Obverse: "LIBERTY" written at the section. Susan B. Anthony portrait facing right in the center. Motto: "IN GOD WE TRUST" written besides his neck. Date at the bottom. 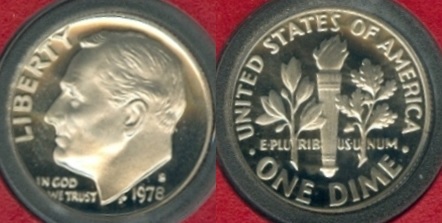 1979P Narrow rim (0.4 mm rim below Date) type. Reverse: "UNITED STATES OF AMERICA" written at the top section. "E PLURIBUS UNUM" written above the Eagle. Eagle flying above the moon with olive branch while planet Earth is in the background [The Apollo 11 Mission Insignia]. 13 stars around the Eagle in circular form. "ONE DOLLAR" written at the bottom. Mintage: 288,015,744 (including both types). 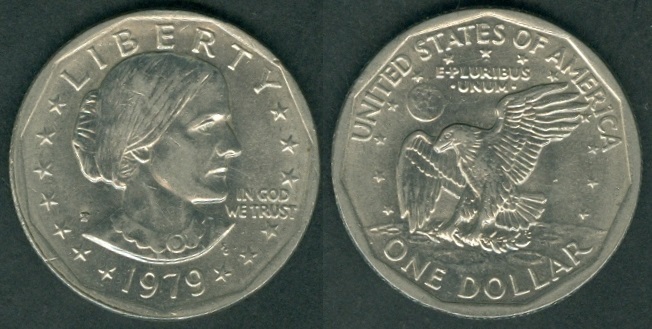 Mintage Years: 1979D Narrow rim (0.4 mm rim below Date), 1979D Wide rim (0.6 mm rim below Date), 1979P Narrow rim (0.4 mm rim below Date), 1979P Wide rim (0.6 mm rim below Date), 1979S, 1979S Proof Type I (Filled S), 1979S Proof Type II (Clear S), 1980D, 1980P, 1980S, 1980S Proof, 1981D, 1981P, 1981S, 1981S Proof Type I (Filled S), 1981S Proof Type II (Clear S), 1999D, 1999P and 1999P Proof. Engraver: Frank Gasparro (both sides). 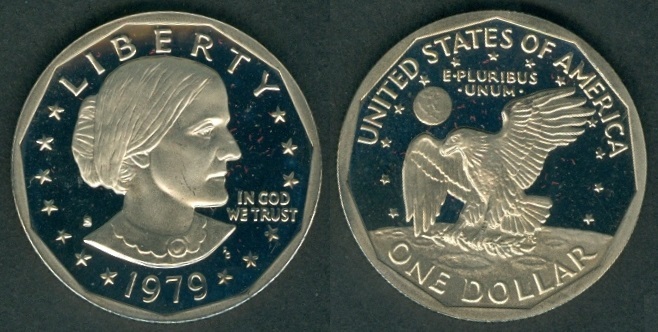 This coin is known as "Susan B. Anthony Dollar" among coin collectors. Note: This coin was minted at three locations: Denver, Philadelphia and San Francisco. Denver coins carry a letter "D", Philadelphia coins have "D" and San Francisco coins carry a letter "S", above Susan B. Anthony's left shoulder. All coins of Denver and Philadelphia were stuck for regular circulation. The San Francisco Mint struck this coin for circulation as well as all proofs for this type. Susan Brownell Anthony (b. February 15, 1820 at Adams, Massachusetts – d. March 13, 1906 at Rochester, New York) was an American social reformer and women's rights activist who played a pivotal role in the women's suffrage movement. Born into a Quaker family committed to social equality, she collected anti-slavery petitions at the age of 17. In 1856, she became the New York state agent for the American Anti-Slavery Society. In 1851, she met Elizabeth Cady Stanton, who became her lifelong friend and co-worker in social reform activities, primarily in the field of women's rights. In 1852, they founded the New York Women's State Temperance Society after Anthony was prevented from speaking at a temperance conference because she was female. In 1872, Anthony was arrested for voting in her hometown of Rochester, New York, and convicted in a widely publicized trial. Although she refused to pay the fine, the authorities declined to take further action. In 1878, Anthony and Stanton arranged for Congress to be presented with an amendment giving women the right to vote. Introduced by Sen. Aaron A. Sargent (R-CA), it later became known colloquially as the Susan B. Anthony Amendment. It was ratified as the Nineteenth Amendment to the U.S. Constitution in 1920. Anthony traveled extensively in support of women's suffrage, giving as many as 75 to 100 speeches per year and working on many state campaigns. She worked internationally for women's rights, playing a key role in creating the International Council of Women, which is still active. She also helped to bring about the World's Congress of Representative Women at the World's Columbian Exposition in Chicago in 1893. When she first began campaigning for women's rights, Anthony was harshly ridiculed and accused of trying to destroy the institution of marriage. Public perception of her changed radically during her lifetime, however. Her 80th birthday was celebrated in the White House at the invitation of President William McKinley. 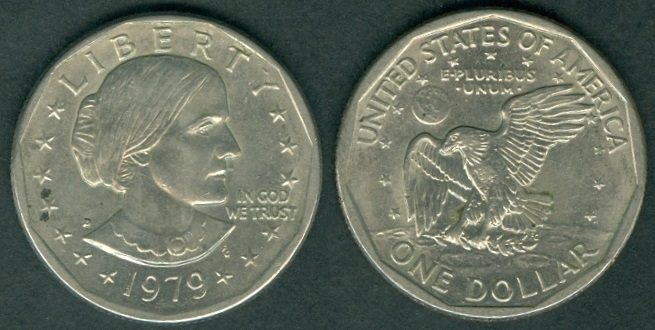 She became the first actual woman to be depicted on U.S. coinage when her portrait appeared on the 1979 dollar coin. This dollar coin was badly accepted and withdrawn. KM#207 Dollar. Year: 1979D. Weight: 8.09 g [8.10 g]. Mint: Denver, USA. Mintage: 360,222,000 (including both types). 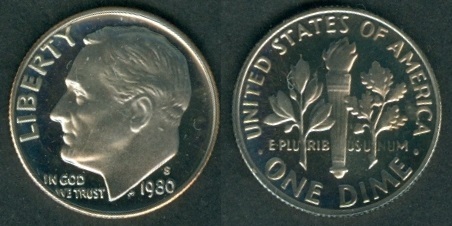 1979P Wide rim (0.6 mm rim below Date) type. KM#207 Dollar. Year: 1979S. Weight: 8.12 g [8.10 g]. Mint: San Francisco, USA. Mintage: 109,576,000 + 3,677,175 Proof (Proof mintage includes both types). KM#201 1 cent. Year: 1980. Weight: 3.06 g [3.11 g]. Metal: Bronze (95% Cu and 5% Zn or Tin). Diameter: 19.00 mm. Edge: Plain. Alignment: Coin. Mint: Philadelphia, USA. Obverse: "IN GOD WE TRUST" motto at the top. Right facing profile of President Abraham Lincoln. "LIBERTY" written at the left side horizontally. Date at the chest of Abraham Lincoln. "V.D.B" written at 7 o'clock near the edge. Reverse: "UNITED STATES OF AMERICA" written at the top section. "E·PLURIBUS·UNUM" (Latin for "Out of many, one") written above Lincoln Memorial building. Lincoln Memorial building in the center. 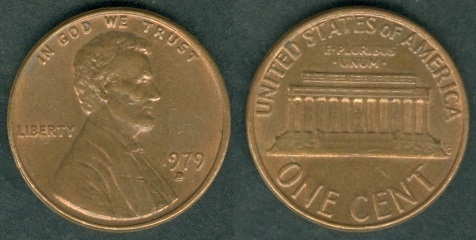 "ONE CENT" written at the bottom. Mintage: 7,414,705,000. Mintage Years: [see under 1959]. Engraver: Victor David Brenner (Lincoln portrait side) and Frank Gasparro (Value side). KM#201 1 cent. Year: 1980D. Weight: 3.14 g [3.11 g]. Metal: Bronze (95% Cu and 5% Zn or Tin). Diameter: 19.00 mm. Edge: Plain. Alignment: Coin. Mint: Denver, USA. Obverse: "IN GOD WE TRUST" motto at the top. Right facing profile of President Abraham Lincoln. "LIBERTY" written at the left side horizontally. Date at the chest of Abraham Lincoln. "V.D.B" written at 7 o'clock near the edge. "D" written below Date. Reverse: "UNITED STATES OF AMERICA" written at the top section. "E·PLURIBUS·UNUM" (Latin for "Out of many, one") written above Lincoln Memorial building. Lincoln Memorial building in the center. 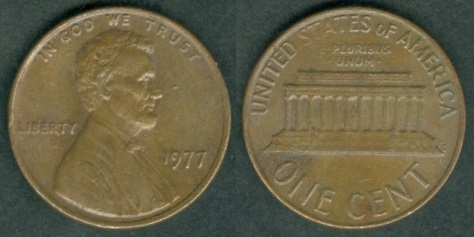 "ONE CENT" written at the bottom. Mintage: 5,140,098,660. Mintage Years: [see under 1959]. Engraver: Victor David Brenner (Lincoln portrait side) and Frank Gasparro (Value side). KM#A132 1 cent. Year: 1980S. Weight: 3.12 g [3.11 g]. Metal: Bronze. Diameter: 19.00 mm. Edge: Plain. Alignment: Coin. Mint: San Francisco, USA. Obverse: "IN GOD WE TRUST" motto at the top. Right facing profile of President Abraham Lincoln. "LIBERTY" written at the left side horizontally. Date at the chest of Abraham Lincoln. "V.D.B" written at 7 o'clock near the edge. "S" written below Date. Reverse: "UNITED STATES OF AMERICA" written at the top section. "E·PLURIBUS·UNUM" (Latin for "Out of many, one") written above Lincoln Memorial building. Lincoln Memorial building in the center. 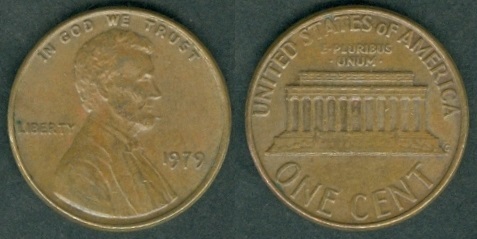 "ONE CENT" written at the bottom. Mintage: 3,554,806 Proof. Mintage Years: [see under 1959]. Engraver: Victor David Brenner (Lincoln portrait side) and Frank Gasparro (Value side). KM#A192 5 cents (Nickel). 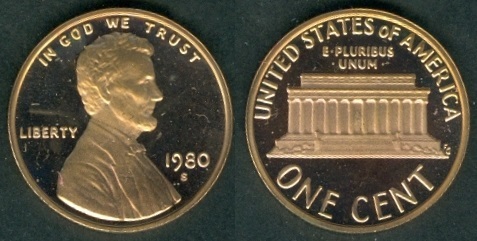 Year: 1980P. Weight: 4.98 g [5.00 g]. Metal: Copper-Nickel. Diameter: 21.20 mm. Edge: Plain. Alignment: Coin. Mint: Philadelphia, USA. 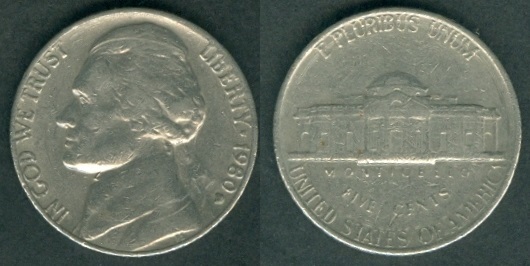 Obverse: The portrait of Thomas Jefferson (The 3rd President of the United States from 1801 to 1809) facing left in the center. Motto: "IN GOD WE TRUST" "LIBERTY" written at the right side clockwise. "LIBERTY" with Date having star (*) in between written at the right side clockwise. Designer’s initial “F” is below the Date. Reverse: "E PLURIBUS UNUM" (Latin for "Out of many, one") written at the top. A representation of Monticello, President Thomas Jefferson's Virginia home in the center. "MONTICELLO" and " FIVE CENTS" written below the building. "UNITED STATES OF AMERICA" written at the bottom section. Mintage: 593,004,000. Mintage Years: [see under 1946]. Engraver: Felix Oscar Schlag (both sides). KM#A192 5 cents (Nickel). Year: 1980D. Weight: 4.91 g [5.00 g]. Metal: Copper-Nickel. Diameter: 21.20 mm. Edge: Plain. Alignment: Coin. Mint: Denver, USA. Obverse: The portrait of Thomas Jefferson (The 3rd President of the United States from 1801 to 1809) facing left in the center. Motto: "IN GOD WE TRUST" "LIBERTY" written at the right side clockwise. "LIBERTY" with Date having star (*) in between written at the right side clockwise. Designer’s initial “F” is below the Date. Reverse: "E PLURIBUS UNUM" (Latin for "Out of many, one") written at the top. A representation of Monticello, President Thomas Jefferson's Virginia home in the center. "MONTICELLO" and " FIVE CENTS" written below the building. "UNITED STATES OF AMERICA" written at the bottom section. Mintage: 502,323,448. Mintage Years: [see under 1946]. Engraver: Felix Oscar Schlag (both sides). KM#A192 5 cents (Nickel). Year: 1980S. Weight: 4.96 g [5.00 g]. Metal: Copper-Nickel. Diameter: 21.20 mm. Edge: Plain. Alignment: Coin. Mint: San Francisco, USA. Obverse: The portrait of Thomas Jefferson (The 3rd President of the United States from 1801 to 1809) facing left in the center. Motto: "IN GOD WE TRUST" "LIBERTY" written at the right side clockwise. "LIBERTY" with Date having star (*) in between written at the right side clockwise. Designer’s initial “F” is below the Date. "S" mint mark seen below the Date. Reverse: "E PLURIBUS UNUM" (Latin for "Out of many, one") written at the top. A representation of Monticello, President Thomas Jefferson's Virginia home in the center. "MONTICELLO" and " FIVE CENTS" written below the building. "UNITED STATES OF AMERICA" written at the bottom section. Mintage: 3,554,806 Proof. Mintage Years: [see under 1946]. Engraver: Felix Oscar Schlag (both sides). KM#195a Dime (10 cents). Year: 1980S. Weight: 2.26 g [2.27 g]. Metal: Copper-nickel clad Copper. Diameter: 17.90 mm. Edge: Reeded. Alignment: Coin. Mint: San Francisco, USA. Obverse: "LIBERTY" is written at the top left clockwise. The portrait of Franklin D. Roosevel (32nd President of the United States from 1933 to his death in 1945) facing left in the center. Motto: "IN GOD WE TRUST" is at bottom left side. Date at the bottom right side. Reverse: "UNITED STATES OF AMERICA" written at the top section. An olive branch, a torch and an oak branch in the center, symbolize respectively peace, liberty and victory. Motto "E • PLU RIB US • U NUM" (Latin for "Out of many, one") written between the stems and base of the torch. Value "• ONE DIME •" written at the bottom section. Mintage: 3,554,806 Proof. (both types: Filled "S" and Clear "S"). Mintage Years: [see under 1965]. Engraver: John Ray Sinnock (both sides). This coin is commonly known by coin collectors as "Roosevelt Copper-Nickel Dime". Mintmark "D" or "S" is above Date. KM#A164a Quarter Dollar (25 cents). Year: 1980P. Weight: 5.60 g [5.67 g]. Metal: Copper-nickel clad Copper. Diameter: 24.30 mm. Edge: Reeded. Alignment: Coin. Mint: Philadelphia, USA. Obverse: "LIBERTY" written at the top. George Washington's head facing left in the center. Motto: "IN GOD WE TRUST" written in two lines at bottom left side. Date at the bottom. Reverse: "UNITED STATES OF AMERICA" written at the top. An eagle, looking left, wings spread, and standing on a shaft of arrows with two olive sprays beneath it in the center. "E PLURIBUS UNUM" (Latin for "Out of many, one") written above the Eagle's head in two lines. 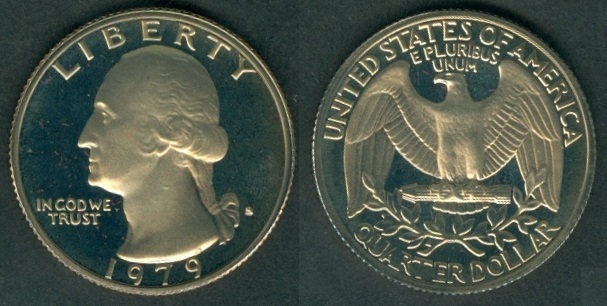 "QUARTER DOLLAR" written at the bottom. Mintage: 635,832,000. Mintage Years: [see above under 1977]. Engraver: John Flanagan (both sides). This coin is commonly known by coin collectors as "Washington Quarter". KM#A164a Quarter Dollar (25 cents). Year: 1980S. Weight: 5.60 g [5.67 g]. Metal: Copper-nickel clad Copper. Diameter: 24.30 mm. Edge: Reeded. Alignment: Coin. Mint: San Francisco, USA. Obverse: "LIBERTY" written at the top. George Washington's head facing left in the center. Motto: "IN GOD WE TRUST" written in two lines at bottom left side. Date at the bottom. "S" mintmark besides the hair ribbon knot. Reverse: "UNITED STATES OF AMERICA" written at the top. An eagle, looking left, wings spread, and standing on a shaft of arrows with two olive sprays beneath it in the center. "E PLURIBUS UNUM" (Latin for "Out of many, one") written above the Eagle's head in two lines. 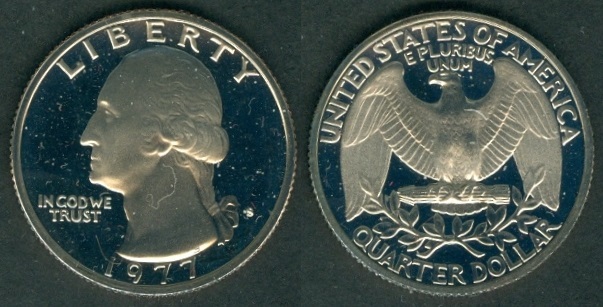 "QUARTER DOLLAR" written at the bottom. Mintage: 3,554,806 Proof. Mintage Years: [see above under 1977]. Engraver: John Flanagan (both sides). This coin is commonly known by coin collectors as "Washington Quarter". KM#A202b Half Dollar (50 cents). Year: 1980S. Weight: 11.20 g [11.34 g]. Metal: Copper-Nickel Clad Copper. Diameter: 30.61 mm. Edge: Reeded. Alignment: Coin. Mint: San Francisco, USA. Obverse: "LIBERTY" written at the section. President John Fitzgerald Kennedy facing right in the center. Motto: "IN GOD WE TRUST" written besides his neck. Date at the bottom. Reverse: "UNITED STATES OF AMERICA" written at the top section. State emblem (eagle with shield with "E PLURIBUS UNUM" on the banner) with ring of 50 stars in the center. One Dot on each side. 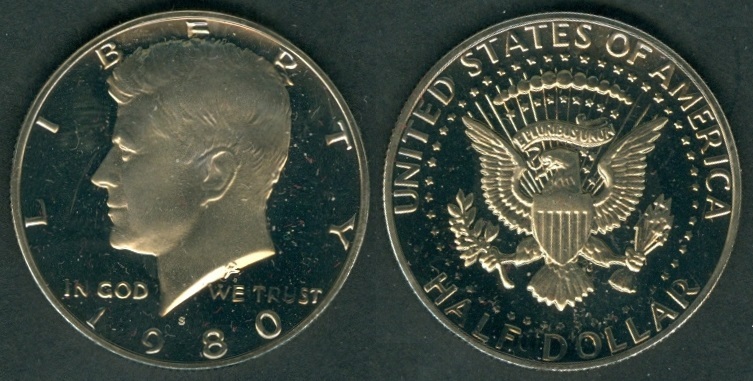 Value "HALF DOLLAR" written at the bottom. Mintage: 3,554,806 Proof. Mintage Years: [see above under 1977]. Engraver: Gilroy Roberts (Kennedy portrait side) and Frank Gasparro (Value side). KM#207 Dollar. Year: 1979S. Weight: 8.01 g [8.10 g]. Metal: Copper-Nickel Clad Copper. Diameter: 26.50 mm. Edge: Reeded. Alignment: Coin. Mint: San Francisco, USA. Obverse: "LIBERTY" written at the section. Susan B. Anthony portrait facing right in the center. Motto: "IN GOD WE TRUST" written besides his neck. Date at the bottom. Reverse: "UNITED STATES OF AMERICA" written at the top section. "E PLURIBUS UNUM" written above the Eagle. Eagle flying above the moon with olive branch while planet Earth is in the background [The Apollo 11 Mission Insignia]. 13 stars around the Eagle in circular form. "ONE DOLLAR" written at the bottom. Mintage: 20,422,000 + 3,547,030 Proof. Mintage Years: 1979D Narrow rim (0.4 mm rim below Date), 1979D Wide rim (0.6 mm rim below Date), 1979P Narrow rim (0.4 mm rim below Date), 1979P Wide rim (0.6 mm rim below Date), 1979S, 1979S Proof Type I (Filled S), 1979S Proof Type II (Clear S), 1980D, 1980P, 1980S, 1980S Proof, 1981D, 1981P, 1981S, 1981S Proof Type I (Filled S), 1981S Proof Type II (Clear S), 1999D, 1999P and 1999P Proof. Engraver: Frank Gasparro (both sides). This coin is known as "Susan B. Anthony Dollar" among coin collectors.